Karami, M., Ghezavati, V. (2018). A differential evolution algorithm to solve new green VRP model by optimizing fuel consumption considering traffic limitations for collection of expired products. 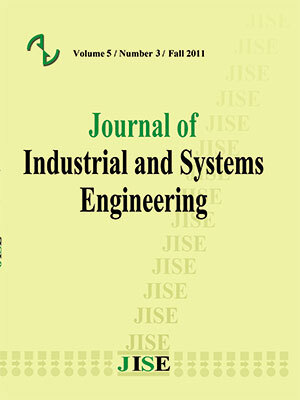 Journal of Industrial and Systems Engineering, 11(2), 251-269. Mojgan Karami; Vahidreza Ghezavati. "A differential evolution algorithm to solve new green VRP model by optimizing fuel consumption considering traffic limitations for collection of expired products". Journal of Industrial and Systems Engineering, 11, 2, 2018, 251-269. Karami, M., Ghezavati, V. (2018). 'A differential evolution algorithm to solve new green VRP model by optimizing fuel consumption considering traffic limitations for collection of expired products', Journal of Industrial and Systems Engineering, 11(2), pp. 251-269. Karami, M., Ghezavati, V. A differential evolution algorithm to solve new green VRP model by optimizing fuel consumption considering traffic limitations for collection of expired products. Journal of Industrial and Systems Engineering, 2018; 11(2): 251-269. The purpose of this research is to present a new mathematical modeling for a vehicle routing problem considering concurrently the criteria such as distance, weight, traffic considerations, time window limitation, and heterogeneous vehicles in the reverse logistics network for collection of expired products. In addition, we aim to present an efficient solution approach according to differential evolution (DE) procedure to solve such a complicated problem. By using mathematical modeling tools for formulating the environmental sensitivities in vehicle routing problems, the reverse logistics must be managed according to criteria such as cargo weight carried by the vehicle, the vehicle speed and the covered distance by the vehicle. This leads to optimization and reduction of transportation fuel consumption and hence reduction of air pollution and environment concerns. This concept has led to creation and study of the green vehicle routing problems in this paper.Numerical analysis indicates that performance of the proposed DE algorithm can be validated in terms of CPU run time and optimality gap for solving the proposed model. Furthermore, sensitivity analysis show that extending maximum travelling distance by each vehicle, and increasing capacity of vehicles lead to reduction of total cost in the problem. Alshamrani, A., Mathur, K., andBallou, R. H. (2007). Reverse logistics: simultaneous design of delivery routes and returns strategies. Computers and Operations Research, 34, 595–619. Ahmadizar, F.,Zeynivand, M., andArkat, J. (2015), Two-level vehicle routing with cross-docking in a three-echelon supply chain: A genetic algorithm approach, Applied Mathematical Modelling, 39 (22), Pages 7065-7081. Aras, N., Aksen, D., andTekin, M. T.(2011). Selective multi-depot vehicle routing problem with pricing. Transportation Research Part C: Emerging Technologies, 19,866–884. Bauer, J., Bektas_, T., andCrainic, T. G. (2010).Minimizing greenhouse gas emissions in intermodal freight transport: an application to rail service design.Journal of the Operational Research Society, 61, 530–542. Buhrkal,K., Larsen,A.,andRopke,S.(2012). The waste collection vehicle routing problem with time windows in a city logistics context.Procedia - Social and Behavioral Sciences39 , 241 – 254. Bektas_, T., andLaporte, G. (2011).The pollution-routing problem.TransportationResearch Part B, 45, 1232–1250. Dell’Amico, M., Righini, G., andSalani, M. (2006).A branch-and-price approach to the vehicle routing problem with simultaneous distribution and collection.Transportation Science, 40, 235–247. Demir, E., Bektas_, T., andLaporte, G. (2012). An adaptive large neighborhood searchheuristic for the pollution-routing problem. European Journal of Operational Research, 223, 346–359. ErdoŸan, S.,and Miller-Hooks, E. (2012).A green vehicle routing problem.Transportation Research Part E: Logistics and Transportation Review, 48(1)100–114. Fagerholt, K., Laporte, G., andNorstad, I., (2010). Reducing fuel emissions by optimizing speed on shipping routes.Journal of the Operational Research Society, 61, 523–529. Faulin, J., Juan, A., Lera, F., andGrasman, S. (2011). Solving the capacitated vehicle routing problem with environmental criteria based on real estimations in road transportation: a case study. Procedia – Social and Behavioral Sciences, 20,323–334. Gribkovskaia, I., Laporte, G., andShyshou, A. (2008).The single vehicle routing problem with deliveries and selective pickups.Computers and Operations Research,35, 2908–2924. Jabali, O., Van Woensel, T. and de Kok, A.G. (2009).Analysis of travel times and CO2 emissions in timedependent vehicle routing.Tech. rep., Eindhoven University of Technology. Krikke, H., le Blanc, I., van Krieken, M., andFleuren, H., (2008). Low-frequency collection of materials disassembled from end-of-life vehicles: on the value of on-line monitoring in optimizing route planning. International Journal of Production Economics, 111, 209–228. Kim, H., Yang, J., and Lee, K., (2009). Vehicle routing in reverse logistics for recycling end-of-life consumer electronic goods in South Korea. Transportation Research Part D: Transport and Environment, 14, 291–299. Kuo,Y., (2010). Using simulated annealing to minimize fuel consumption for the time-dependent vehicle routing problem. Computers and Industrial Engineering,59(1), 157–165. Kara,I., Kara, B., and Yetis, M., (2007).Energy minimizing vehicle routing problem.Lecture notes in computer science (Vol. 4616, pp. 62–71). Le Blanc, I., van Krieken, M., Krikke, H., andFleuren, H. (2006). Vehicle routing conceptsin the closed-loop container network of ARN – a case study. OR Spectrum, 28,53–71. Maden, W., Eglese, R., and Black, D., (2010).Vehicle routing and scheduling with timevaryingdata: a case study.Journal of the Operational Research Society, 61,515-522. Mingyong,L. and Erbao , C.(2010). An improved differential evolution algorithm for vehicle routing problem with simultaneous pickups and deliveries and time windows.EngineeringApplications of Artificial Intelligence 23, 188–195. Pronello, C., and André, M. (2000).Pollutant emissions estimation in road transport models.INRETS-LTE Report, Vol. 2007. Palmer, A. (2007). The development of an integrated routing and carbon dioxide emissions model for goods vehicles. Ph.D. Dissertation, School of Management,Cranfield University. Privé, J., Renaud, J., Boctor, F., andLaporte, G., (2006).Solving a vehicle-routing problem arising in soft-drink distribution.Journal of the Operational Research Society, 57, 1045–1052. Suzuki, Y. (2011). A new truck-routing approach for reducing fuel consumption and pollutants emission,Transportation Research Part D, 16, 73–77. Schneider, M., Stenger, A., andGoeke D., (2012).The electric vehicle routing problem with time windows and recharging stations.Technical Report, University ofKaiserslautern, Kaiserslautern, Germany. Sbihi, A., andEglese, R. W., (2007).Combinatorial optimization and green logistics.4OR: A Quarterly Journal of Operations Research, 5, 99–116. Schultmann, F., Zumkeller, M., andRentz, O. (2006). Modeling reverse logistic tasks withinclosed-loop supply chains: an example from the automotive industry. European Journal of Operational Research, 171, 1033–1050. Taveares, G., Zaigraiova, Z., Semiao, V., and da GracaCarvalho, M. (2008).A case study of fuel savings through optimization of MSW transportation routes.Management of Environmental Quality: An International Journal, 19, 444–454. Torfi, F.,ZanjiraniFarahani, R., andMahdavi,.I., (2016), Fuzzy MCDM for weight of object’s phrase in location routing problem, Applied Mathematical Modelling, 40 (1), Pages 526-541. Ubeda, S., Arcelus, F. J., andFaulin, J. (2011).Green logistics at Eroski: A case study.International Journal of Production Economics, 131, 44–51. Xiao, Y., Zhao, Q., Kaku, I., andXu, Y. (2012). Development of a fuel consumption optimizationmodel for the capacitated vehicle routing problem. Computers and Operations Research, 39(7), 1419–1431.